Kenton's Infotainment Scan: You're a hypocrite. And so am I! There's a lot of hypocrisy going around these days. I'm talking about you, Google, and your famous corporate motto: "Don't be evil." If you're so "not evil," then why do I keep reading about your issues with violating people's privacy? And lifting Wi-Fi passwords? And doesn't using other people's work to sell AdWords bother you even a little? As my pal Jesus once said: "You hypocrites!" 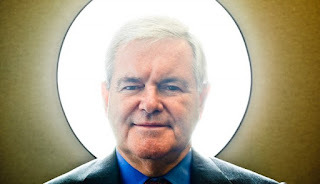 And what of Newt Gingrich, who had the hypocritical gall to impeach Bill Clinton for having an extramarital affair while he himself was doing it - and for the second time on the second wife. Newt's explanation, a decade later: "I'm not a hypocrite!" No - you're a hippo-critter, you little scamp. There's so much bloody hypocrisy going around, at some point one has no choice but to look in the mirror and ask, "Could it be that I myself am a hypocrite?" Before you go back to your fool's paradise, let it be said that to deny being a hypocrite may be the greatest hypocrisy of all. Before this gets too deep and meta for you, I'll just admit it: I'm a hypocrite. I know I am, because I hate it when students don't listen in the classroom. However, when I'm a student, my eyes glaze over, my mind wanders, and I think, "If I'm not speaking, then this must not really be important." I also really love telling people about my vacations, but hate listening to other people tell me about their vacations. I firmly believe that happens in Vegas is absolutely boring to people who weren't in Vegas. Could it be that - gasp - there's a little hypocrite in all of us? "Maybe we all have some degree of hypocrisy, but it's the ones who pontificate about their staunch views and then get caught doing the opposite who really get celebrated for being hypocritical." Like our friend, the good Pastor Ted Haggard, who slammed gay marriage at the same time he was slamming...aww, you can figure out the rest. "With don't be evil, Google set itself up for accusations of hypocrisy anytime they got near the line. Now they are on the defensive...when people are defensive they can do things that are emotional, not reasonable, and bad behavior starts." So bad behavior causes allegations of hypocrisy, which leads to more bad behavior? I knew my hypocrisy was all your fault. You hypocrites!